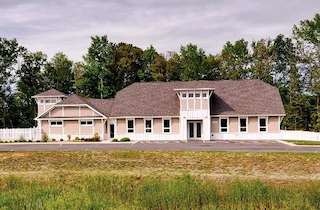 The clubhouse at Red Mill Pond offers a fitness center, swimming pool, spaces for hobbies, games and more. Red Mill Pond opened in 2009, featuring single-family homes built by K. Hovnanian and NV Homes. There is no age restriction for residents, but the community's amenities and homes are an ideal fit for active adult retirees. Currently, homebuyers can choose from available resale and new construction homes. Amenities at Red Mill Pond are centered around the 5,000 square-foot clubhouse. This inviting facility is a great place to socialize or take part in community clubs and events. The clubhouse features a fitness room with cardiovascular and strength-training equipment, a spacious catering kitchen and a comfortable lounge area. Residents can also enjoy a game of cards or billiards, or gather with special-interest clubs in the meeting room. 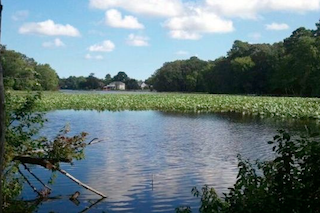 The actual Red Mill Pond is a main attraction offering boat access, water recreations and picturesque views. Living beside its namesake, Red Mill Pond offers water-based recreations such as boating or kayaking. Scenic walking trails lead to the pond and to the gazebo as well as the boat launch at the water's edge. Residents who love to swim, or just relax poolside, will also enjoy the clubhouse's outdoor pool area. Single-family homes at Red Mill Pond are offered in two collections: one by K. Hovnanian and the other by NV Homes. These thoughtfully designed residences feature main-level living, although some come with second-story lofts for storage or extra bedrooms. Most homes come with standard basements, which can be optionally finished, and every home has a two- or three-car garage. The K. Hovnanian collection features six floor plans, ranging in size from 1,200 to 2,239 square feet. Homes include two to four bedrooms, and two to three-and-a-half bathrooms. Most also have an optional den. Open floor plans include spacious kitchens with cozy breakfast nooks, while master bedroom suites are complete with large bathrooms and walk-in closets. Residences offered by NV Homes are a bit larger with models ranging from 2,068 to 3,211 square feet. They include two to four bedrooms, and two to four-and-a-half bathrooms. Some have dens as well, and the two largest models can be built with a three-car garage. Spacious master bedrooms suites feature spa-like bathrooms with separate soaking tubs and large walk-in closets. At Red Mill Pond, thoughtfully designed homes, an inviting clubhouse and a prime location in Southern Delaware all come together to create a fabulous active adult retirement destination.